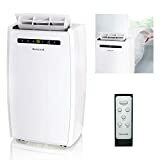 Honeywell - MN10CESWW : Portable Air Conditioner Review • The Air Geeks, reviews of air conditioners, dehumidifiers and air purifiers. We like Honeywell products for their straightforwardness : easy to use, sturdy and clear. The Morristown, NJ firm does not put its emphasis on style or compactness, but they make units that work. The MN10CESWW is a 10,000 BTU air conditioner that is designed to cool a 400 square feet space. It features a dehumidifier that is capable of removing air moisture in your room at an impressive official rate of 79.2 pints/ 24 hours (during our test at room temperature though, we were around 25pint per day, or one third of that). We also like the fact that it is reasonably quiet, not a common feature in the little world of AC units. 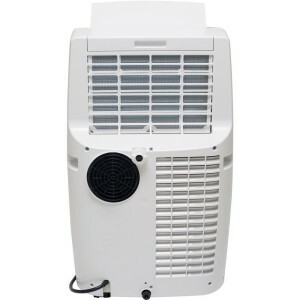 If you are looking for a quiet and efficient air conditioner for your room, then you should consider this portable unit. With its stable performance, it will certainly meet your cooling needs as long as your space does not exceed the limit recommended by the manufacturer. Moreover, this compact system is centered on a three-in-one technology and it will therefore offer you three functionalities. It is suitable for cooling, dehumidifying, and fanning your space. Our review details the good, the bad and the ugly. Let’s get down to it! To begin with, the MN10CESWW is pretty compact for an air conditioner. : 15.2 x 18.1 x 29.4 inches and 49.6 pounds for an AC unit is a satisfactory size for a portable air conditioner that can be easily moved from one part of the house to another. It features caster wheels for easy mobility and therefore does not need permanent location. The four wheels eliminate the need to lift or carry the unit. This Honeywell unit is designed to deliver a 10,000 BTU cooling capacity. This capacity is supposedly ideal for a space as large as 400 square feet. In truth, we were closer to a ~250 sq ft very satisfactory cooling, the rest being cooler, but not spotlessly cool after 3 hours. It is important to note that this figure (400 sq ft) is a manufacturer estimate that assumes average room conditions and the size can be affected by ventilations and other openings in a room. This portable air conditioner comes with a window venting kit that fits in most standard windows. Users can also easily install it on other openings with minor modifications. The window vent is non-permanent and this allows users to remove it every time the system is not in use. In addition to this easy-to-install window vent, the system also comes with an exhaust hose. As we shall see however, these two systems are sometimes hard to install : the depend on the size and shape of your window and home, and there is no “one-size-fits-all” solution. Dehumidification! Yes, this unit does dehumidify. The MN10CESWW is based on a 3-in-1 technology which enables the system to deliver cooling and dehumidification functionalities to its users. This portable air conditioner is engineered to dehumidify a room at a rate of 79.2 pints/ 24 hours. However, as always, do not trust the label! Our test show a rough 25 pints / day at max. 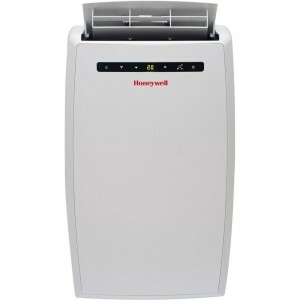 The Honeywell model uses a 3M electrostatic filter to provide users with fresh and clean air. The unit also offers a fan-only function. But what happens after you dehumidify? Emptying water from an air conditioner’s tank is a boring task especially if the water is accumulating at a high rate. The situation can be uglier if the water accumulates and the system starts to leak. This portable air conditioner is designed not only to deliver cooling and dehumidification functionalities simultaneously but also to auto evaporate water therefore making it unnecessary to have a bucket where water accumulates. In other words, its auto evaporation system prevents any condensate accumulations and users therefore don’t need to empty water from the unit. To enhance user comfort, this sleek unit comes with a full-function remote control. This eliminates the need for a user to walk to where the system is positioned… Not bad! Furthermore, this portable air conditioner features an intuitive user interface that is made up of feather-touch electronic controls. The unit’s programmable timer enables the system to start and go off automatically at preset times. So, everything good? Unfortunately no. A non-negligible cases of the unit stopping to work after a year of use has been reported. At the Air Geeks, sturdiness is one the chief points we are looking at : units should keep working for the next 10 to 15 years after they are bought. For some users however, this was not the case and the unit stopped functioning. Not good. If you do buy, buy with warranty. Recommended Room Size 400 sq. ft.
Easy installation. It is easy to set up the unit. It takes any one who reads the manual no more than 30 minutes to fully assemble it. Highly efficient. The system cools and dehumidifies rooms quite efficiently and quickly. Quiet operation. Or shall we say “not extremely noisy”? Most users who have used various air conditioners concur that the noise produced by this unit is lower as compared to what other systems produce. Quality problems after a year of use. The is not the base case, but some users have had quality problems, and went as far as returning it after one year. Small imperfections if you want to use the drain. The unit has a short hose, and not a very well insulated one. What is more, the window kit does not fit well on some windows. Some users had to do some modifications for the system to fit well on their windows. I bought the AC last week after being hit with 90F weather in Southern California and because my 2nd floor bedroom facing the sun during the day makes sleeping at night unbearable. I also rent so landlord doesn't allow us to install anything to the window/wall. AC arrived on time and assembling it was very easy. There are cheaper ones at Home Depot, but Consumer Report rated this one as #1 and I wanted it to be delivered because it's so heavy (I'm single & live alone). The only part that needed extra work was the window kit because it was too small for my window even after the extension. So, I went to Home Depot and bought a piece of wood that they cut to my measurements, which in my case was 12" in length. I also bought weather stripping to ensure there would be no gaps in installation. I painted the wood piece white and then assembly was a piece of cake after that. The only eye sore is the exhaust tunnel/pipe which the cat tree hides nicely. See the pictures for more detail. I slept really well last night and I even felt cold and had to lower the temperature :) I'm very happy with this product!" I have been thinking about trying out a portable AC but I had been holding back because I saw bad reviews on many other brands sold at Costco. I stumbled on this unit and found out so many good reviews on this products, for which I made up my mind to buy it and give it a try. As most users pointed out, I experienced the easiness of assembling the exhaust hose unit and had the unit up-and-running in 10 minutes. Immediately after 5 minutes or so, I already feel it to cool down my room and remove excess humidity. This unit is simply amazing. I set it up at my Living Room, Not only does it cool down my Living room and the dining room next to it, but it also cool down my kitchen with big eat-in area when I use a floor fan to circulate the cool air to the eat-in kitchen area. What is more amazing but no surprise is that it helps to remove humidity and therefore it makes my basement Dehumidifier run less in time. My basement is now drier as i can feel no moisture in my cardboard boxes in basement. When the unit AC is on, the exhaust hose does get hot and I will see if I can wrap an isolation on it? When the unit AC is off, my kill-a-watt unit measured about 43 watts with the fan on." Really, we were satisfied for the price. However, let us note that some users have reported a drop in the unit’s performance, and incidents that shouldn’t happen after only a year of service. We recommend the purchase, but not without a warranty!